September 2013 – SSA or Gay? I normally don’t like asking for money, but I will today. This school funding campaign is going to close in three days, and they still need to raise $163 to be able to get the requested printer. Any donation will help. If you could help spread the word, I would appreciate it. Donors Choose is a wonderful organization that has help teachers raise money for those “extras” that enhance learning. It’s great that educators have avenues like this to obtain tools that they used to use their own hard-earned money to purchase. I will post something more interesting later. I don’t know what has changed recently, but I have had another uncomfortable incident this past week. Another adult confronted me in a hostile manner, but this time I know it was because of my sexual orientation. I was waiting outside a county rec center after swimming with my local team. A man approached me and asked where the nearest bar was. I told him the closest ones I knew of were downtown–approximately 20 blocks away. He then asked how to get there, and I suggested he take a bus. He left. His demeanor was a little bit strange, but I felt safe because there was a large crowd finishing a company dinner in a park pavilion near the pool. The sun was setting, and people were busy cleaning and packing their picnic supplies and families into their cars. The man wouldn’t try anything stupid with so many people around. Soon other friends were gathering in the parking lot. We talked about meeting somewhere for dinner and decided to go to a new restaurant just down the street. The picnic crowd was gone, and just a few swimmers from my team remained. I was talking with a friend, Mike, and we were planning to walk to the restaurant when the intoxicated man approached us again. “Is this the library?” he asked. “No, it’s a pool,” Mike answered. The man started walking to the building’s front doors, which were now locked. I thought he must be looking for a public restroom. “What are you looking for?” Mike asked. “Is this where the fags meet?” he then asked. I laughed, but tried not to let the drunk man see it. The man was looking in the rec center’s front door, and he then turned and started walking towards us. I experienced a brief flashback to my mid-August altercation; this couldn’t be happening again. Thankfully, my friend’s car was close, and we avoided any more problems. We didn’t say anything else about the situation on our short ride to the restaurant, and we didn’t tell anyone else about it during dinner. Now I wonder if we should have done more. Should we have stood up for ourselves, or would we have put ourselves in danger for speaking up? Was it our responsibility to let others know what happened so that they can be more cautious at the pool? I am ashamed I didn’t do anything. What bothers me the most is that I still haven’t told anyone outside of this blog and the police officers about what happened to me during my Saturday morning jog last month. Mike doesn’t know, and I don’t know if he saw how much this brief incident frightened me; he left the restaurant early, and I remained there as other people finished their meals. I wound up walking back to the rec center alone. I am not going to lie–I was terrified of running into that man again and getting beaten up in an empty parking lot. My car was one of three when I returned, and it was in a darker section away from the light posts. I made it into my care safely, and my heartbeat decreased as I got onto the freeway to my home. I couldn’t get the thought of what could have happened out of my mind, however. We read so much in the news now about childhood and teenage bullies, but we don’t do much about the adult bullies in our lives. The problem is that much of what an adult bully does is protected under our constitutional free-speech rights. I believe in protecting those rights, but too often such hateful speech eventually leads to crimes. How can we allow for complete freedom of speech and cut down on hate crimes in our communities? If anyone has the answers, I would like to know. It’s confession time. I love football season. I love the smell of hotdogs and popcorn in a crowded stadium. The echoes of a drum line and announcer make my heart skip. I love sitting in a large arena jammed with thousands of screaming fans. I enjoy the cheers and jeers amidst the crunching of helmets and shoulder pads. I love college football, and my favorite team is BYU. I think my love of the game began when my family first got season tickets when I was twelve. I reluctantly got into our station wagon for our first trek to Provo for a game led by Jim McMahon. I didn’t know what to expect, but I was instantly awed when we entered the stadium. I hadn’t really watched a football game up to that point–my family didn’t really watch much TV, and if the tube was on, we weren’t watching sports. I didn’t understand what was happening during the first game, but I enjoyed what I saw. The offensive and defensive battle on the field enthralled me, the marching band entertained me, and the cheerleaders managed to draw me into the loud audience participation. I have fond memories of attending every game of BYU’s national championship season, storming the field after the Cougars upset number one ranked Miami, and getting drenched during Lavell Edward’s last game as a head coach. The games were an escape from the brutal realities of life. Can a gay man be a BYU Football fan? It’s been several years since I have been a season ticket holder. I guess I stopped buying tickets about the same time I came to terms with being gay. I told myself I stopped for financial reasons, but I think part of me felt like BYU was no longer a place I would feel at home. I still watch every game I can on TV, but I miss the magic of the stadium. I feel the game tugging at my heart. I want to return. I want to be a part of the crowd. 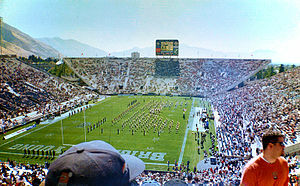 Part of me wonders what it would be like to take a boyfriend–in my dreams he’s also a BYU fan–to Lavell Edwards Stadium and cheer on our mighty cougars. Would we stand out? Would anyone even know we were a couple? Would we be invited to leave? Should our sexual identities even matter? While I am getting ready to watch the Cougars take on Texas in a little over 30 minutes, I am setting a goal to get financially and emotionally ready to once again become a BYU Football season ticket owner. I miss it. The other night I had an unexpected debate on Facebook about pit bulls. A friend–somebody I haven’t seen in years but keep in touch with on Facebook–posted a comment about dogs. She was upset because a friend’s dog was mauled by another dog, and it died. Her response is that all pit bulls should be banned and even exterminated. While I can understand being upset by what happened, I thought her proposed solution was a bit extreme. Against my better judgment, I posted a link to information about pit bulls that I thought she might find useful. It presented interesting facts about how pit bulls are a misunderstood breed. 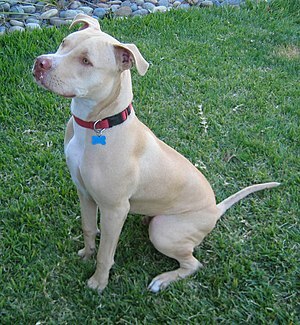 As a matter of fact, pit bulls aren’t an actual breed, but a grouping of a few breeds and mixes of dogs. Some of those dogs who get classified as pit bulls have mild temperaments, while others have been trained to be fighters and at times are dangerous to other dogs and people. The website link I posted also gave wonderful advice on how to train and raise your dogs to be good and faithful pets. How’s this for a metaphor? I couldn’t help but compare this social media experience with all of the bickering I see over gay rights in the readers forums of the local newspapers. People are so tied to their opinions and feelings, that we don’t want to search for the real answers to our social problems. The arguments often go back and forth between people who make and attempt to prove their points with actual evidence from credible sources and their opponents who argue based on emotion. LGBTQ men and women have a few things in common with pit bulls. Like the dogs, we are a big mix of personality types and temperaments. We have a wide array of interest and talents. Yet, to those who don’t understand, we are all the same. All gays, according to some of the more persistent posters, are immoral, militant, and godless heathens who won’t be satisfied until we destroy families, religion, and the traditional and wholesome American way of life. 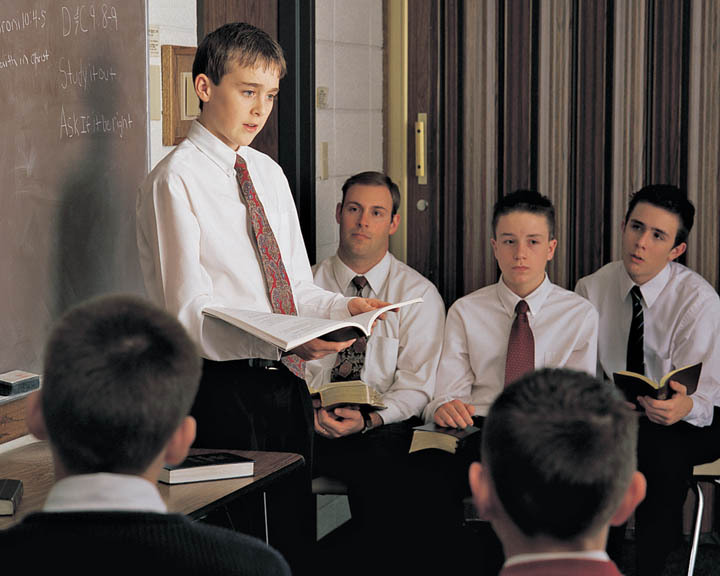 The truth, however, is that some gay men and women are religious; some are not. We have a wide range of moral codes and limits. Some are vocal activist, but others are more content to change the world by quietly influencing the people in their small corner of the world. Some may be dangerous, but most are harmless people who just want to be free to quietly live happy and fulfilling lives. Regardless of our differences, we all deserve to be treated with the same dignity as everyone else in our communities. It alarms me that so many people admit to being so lazy that they don’t want to spend the time to research the facts. We have become a generation that relies too much on the easy emotion-based answers instead of searching out the correct answers. Finding those answers depends on our ability to identify reputable sources and evaluating their arguments before we come to our own conclusions. We look for the Wikipedia answers instead of conducting real, reputable research. Emotional-filled stories are great, but if they aren’t back up with some reliable bits of truth, it’s just a bunch of emotional drivel that won’t have any true lasting power. I am trying to formulate a theory in my mind, but I am not quite sure I can get the words right. I will try to explain it, anyway. Emotions guide so much of what we do and say in life. If we leave our emotions unchecked, we can cause ourselves and others too much trouble and grief. Emotions can be a good guide, but those emotions must be based on solid reasoning skills. We need to be able to step away, research topics to make sure our feelings and ideas are backed up by truth. One thing too many people don’t understand, however, is that truth can always be proven. There is sufficient evidence to back up truth–even in a religious context. Here’s hoping that my friend, and all friends, will learn to search for truth from reputable sources and not make the easier decisions based on emotion because the evidence takes too much effort to read. Yesterday I posted about being assaulted in the park recently. I’m still not sure why it happened. The police officer who took my report suggested that it could be that I was wearing blue shorts. There has been some gang activity across the valley recently, and gang members have been challenged to randomly attack someone wearing the rival gang’s colors. That’s just a theory, but I don’t think that’s the reason. I believe that something fishy was going on with the people in the parked car. I’ve seen them parked in the same spot early in the mornings more than once. Perhaps they are living in the car, and they don’t want police officers telling them to move the car somewhere else. It could also be that they are meeting people to sell drugs or stolen items. Those are just theories, however. I didn’t even consider the incident to be a hate crime, but I have received a few emails asking me what I was wearing while running. While not coming out and saying it, I think they were asking me if I looked gay. Could I have been attacked because I look gay? I hope not. I would rather it have been just a random incident that had nothing to do with my sexuality. Looking back at my running attire for the day, I have to admit that I was wearing a white v-neck t-shirt. I wear them as undershirts most of the time. They are less constricting than crew-neck shirts, and they are great to go under a button-down shirt at work. Unfortunately, they have become stereotypically the style of shirt a gay man would wear. A quick search on the internet brought some interesting results. I expected to find a lot of posts, but a lot of websites identified men who wear that style shirt as hipsters or another name I choose not to use in my blog. The first entry on my search brought up a Bodybuilding.com forum post where somebody asked “are v necks gay?” I was surprised by the responses. According to another website, an entire nation has declared that any young man wearing a V-neck t-shirt must be gay. The funniest trend I found, however, is that most people more readily identified the men who wore the deeper v-neck t-shirts as more likely to be gay. My gay friends, however, shy away from the deep V-necks and tend to go for the styles commonly sold at Target or H&M. So, whether I was assaulted because I looked gay or because I was wearing some rival gang’s colors doesn’t really matter as a bigger problem we face in our communities. We are too quick to divide people based on the way we dress or act. It’s long past due for us to honor and celebrate the diversity that we bring to our communities. I wish I knew what to do to get people get along, and I won’t stop searching for answers. Posted on September 1, 2013 September 2, 2013 Categories CommentaryTags Crew neck, Gang, gay, Gay Lesbian and Bisexual, Hate crime, homosexual, Salt Lake City, Shirt, Shopping, Utah7 Comments on Do I look gay?